Long Beans with Red Curry Paste Ingredients: 4 cups long beans, cut into 1 1/2 in. pieces 3 tablespoons of vegetable oil 1 tablespoon of red curry paste mixed with 1/2 cup of water a teaspoon of sugar a tablespoon of fish sauce 15 to 20 basil leaves Heat vegetable oil in a pan or wok at medium to high heat. do you have a recipe you’d like to share using this ingredient? 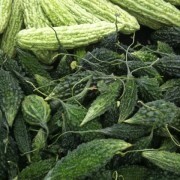 Though similar in size and shape as a cucumber, with its warty, wrinkled bright green skin, bitter melon sure stands out. Yes, it is an acquired taste. Its infamous bitterness comes from an organic compound – the alkaloid momordicine – which increases in intensity as the bitter melon ages on its vine. Bitter melon is part of the gourd family which includes squash and melons. Though we treat it like a vegetable, it is officially the fruit of a vine plant. In some farmers markets and Asian markets, can can also find bags of fresh shoots and leaves of the bittter melon plant for sale, also very edible. Bitter melon comes in a variety of shapes and sizes. The Chinese variety is the size and shape of a cucumber, light green, with bluntly tapered ends and signature warty skin. Here in Hawaii we are also lucky to be growing the smaller dark green bitter melons that are popular in Filipino, Cambodian, Thai and Indian cuisine. Known as goya in Okinawa, bitter melon is credited as contributing to the longevity and sharp mindedness associated with the benefits Okinawan cuisine and philosophies of living. It is chockful of iron, potassium, calcium and betacarotene. It is also thought to be a blood cleanser and a liver booster. – Always wash your bittermelon before preparing. – If stir frying, cut the bitter melon lengthwise and scoop out the seeds and white pith with a spoon. Skin is edible. Slice diagonally into 1/4 inch thick, C shaped pieces. – If stuffing, cut into sections and remove seeds and pith carefully with a spoon. – Blanching or salting for a few minutes first will reduce bitterness. Blanch or parboil for three minutes, soak in salt water, or rub with salt and let sit for a few minutes before cooking. – Bitter melon can be stewed (like in pinakbet) and stir fried. It can be added to curries and soups. – Hollowed out in little log sections it is good for stuffing with meat or seafood and cooked. – It makes a delicious namasu with seaweed and thinly sliced onions. – Young shoots and leaves can be stir fried or added to soups. Look for unblemished bitter melon, free of brown or yellow. It it thought that younger bitter melon is less bitter. Store bitter melon loose in a paper or plastic bag in the refrigerator for 3 to 5 days. Key is to avoid moisture build-up with can lead to rot. Bitter melon has also been used at a bittering ingredient in beer brewed in Okinawa and China – as a locally grown replacement for hops.